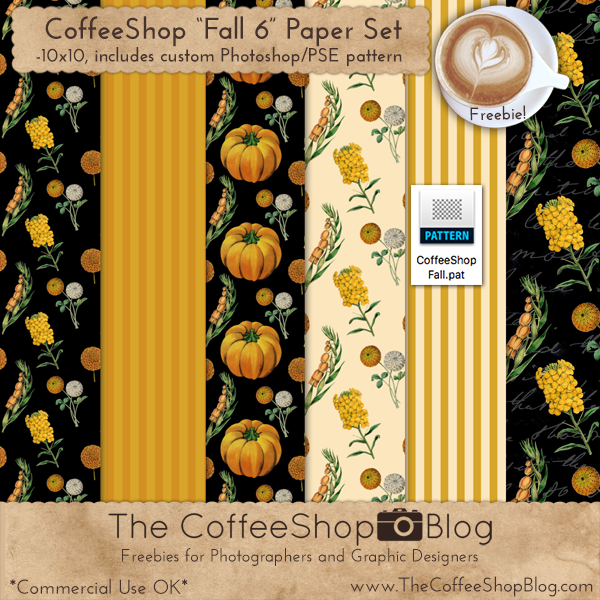 The CoffeeShop Blog: CoffeeShop "Fall 6" Digital Paper and Pattern Set! CoffeeShop "Fall 6" Digital Paper and Pattern Set! I had so much fun designing my newest fall-inspired digital paper and pattern pack. I used some gorgeous floral designs from The Graphics Fairy Premium site (I am an part-time instructor over there) and this pumpkin on their free site. I included two custom Photoshop/PSE patterns I designed to create these papers. You can use these papers or patterns in your personal or commercial work, no attribution necessary (but always appreciated). Download the CoffeeShop "Fall 6" Paper and Pattern Pack.